A job defines what software should be deployed on the device under test (DUT) and what actions should be performed there. Jobs are defined in YAML files. Here’s an example minimal job that you should be able to use right away if you have user access to an appropriately-configured LAVA installation. Explaining the first job in detail. lava-tool is a general-purpose command line interface for LAVA which can be used directly on the LAVA server machines and also remotely on any computer running a Debian-based distribution. See lava-tool for more information. It may take some time before the job actually starts, depending on the number of jobs waiting in the queue for a device of this type. Once the job starts, the status information will automatically update and the logs will appear. Results are populated live and will start to appear during the operation of the deploy action. The plain log can be downloaded and the definition is available for later reference. If you are the submitter of the job, you can also choose to cancel the job. format: "Lava-Test-Shell Test Definition 1.0"
- "lava-test-case passtest --result pass"
- "lava-test-case failtest --result pass"
This simple test executes a series of commands in the booted image. The exit value of each command is used to determine whether the test case passed or failed. You can try any of these commands on a Ubuntu or Debian system to see what the commands should create as output. The results include the test definitions submitted within the job as well as a reserved lava set of results generated during the operation of the test job itself. There is also metadata which is generated by the test job, including details like the URL of the test definitions used and the type of deploy and boot methods involved in the test job. 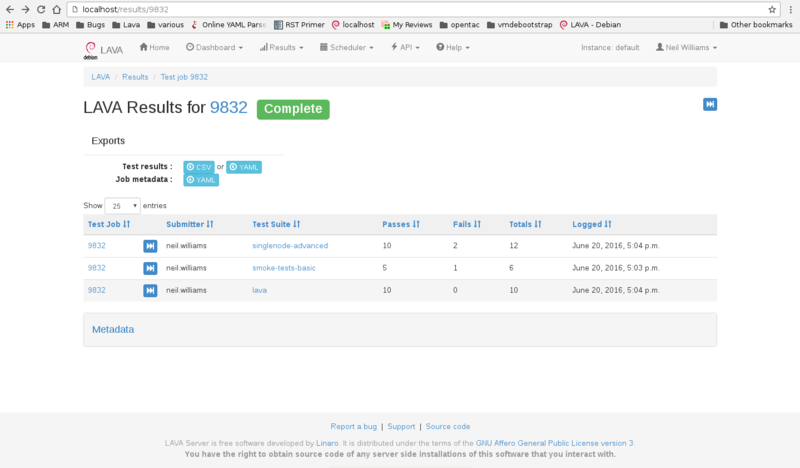 LAVA makes the test results available directly from the instance, without needing to go through lava-tool. The results for any test job which the user can view can be downloaded in CSV or YAML format. If you know the test definition name, you can also download the results for that specific test definition only in a similar way: https://validation.linaro.org/results/123/0_singlenode-advanced/csv for the data in CSV format and https://validation.linaro.org/results/123/0_singlenode-advanced/yaml for the YAML format. Remember to check the YAML syntax of your test job files using the Online YAML parser before submission. The Scheduler menu contains a Submit Job action which can be used to submit jobs to any instance using your browser. You need to be logged in and have permission to submit jobs to that instance. The web submission form for a localhost installation would be http://localhost/scheduler/jobsubmit. If a link to a test job YAML file is pasted on the above screen, the YAML file will be fetched and displayed in the text box for submission. Make sure that the link is to the raw content of the YAML file, not HTML. lava-tool is a wrapper around the XML-RPC API with helpers for personal usage. The XML-RPC API itself supports a variety of queries and operations which can assist in creating a frontend to LAVA which can automate the submission of test jobs. Many languages have XML-RPC support, the API help page on each LAVA instance provides a python example script, with and without using tokens. Job submission requires using an authentication token and should use https wherever possible to protect the token. 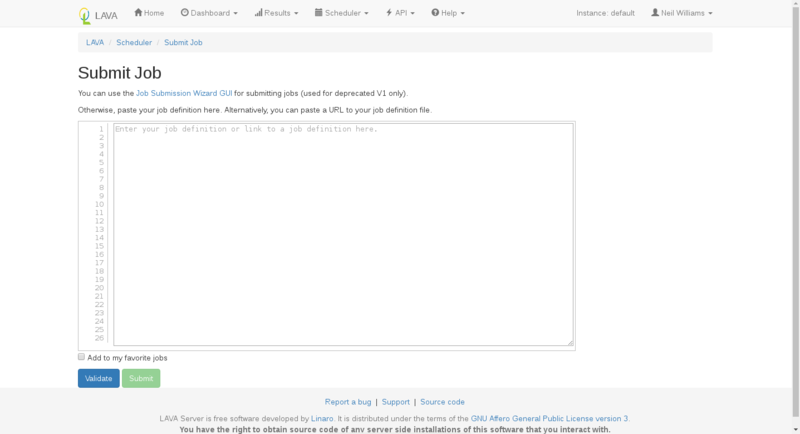 For help using the XML-RPC API to submit jobs, see the sections on lava-tool and the Available methods link from the API menu of the LAVA instance. For example: http://localhost/api/help.